The Fall River fishing is considered to be the best spring creek fishing in the state. The river begins in an area called Thousand Springs and winds its way for 17 miles to where it dumps into the Pit River near Fall River Mills. This fly fishing stream has got the attention of the wealthy and they continue to purchase land around this great fly fishing stream because it is such a good location. There is plenty of wildlife and birds to keep an eye on while visiting this stream making the experience just that much better. This river is best floated by a boat, and there is great access at the boat ramp located on Island Road. Be prepared to carry your boat down the path to the water. Much of the land on the river is private so wading access is limited. You can take your boat to the Caltrout access located off of highway 299. The access to the river can be tough and so can the fishing. The heat in the summer forces the fish to go deep into the water where only a well placed streamer can catch their attention. In the mornings and early evenings you will be able to catch these fish with some good presentations of the right dry fly. Having a hatch chart and knowing what is hatching is critical. Hatch fly fishing is the best way to increase your odds against the fish. This river contains some healthy wild Rainbow Trout that feed on the impressive hatches. Fish can be over 20” since there are consistent water temperatures and a healthy insect population. Fly-fishing this stream will require great skill, as the water is clear and slow. Because of the clear water, a fisherman will need to have a great approach, and very delicate casting skills to net some fish. Many of the larger fish hang out by the banks because of the vegetation and available insects. Some of the better hatches include Pale Morning Duns and Blue Winged Olive. The most known hatch on the river is that of the Hexagenia Mayfly (the Hex) which occurs in late June and into July in the early evening. 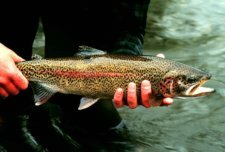 If you consider yourself an expert fly-fisherman you should try out your skills and search for these “monster” trout. When fishing Northern CA. you don't want to miss this river! Map of this Northern California river. Leave the Fall River and return to California page.